Grace notes that the trimmed down categories ensure that only the best work is recognised. “Advertising is one of the few industries where award shows are a big part of driving the agenda for businesses,” he adds. “Awards are really about talent attraction. Ultimately marketing agencies are a service business and are totally reliant on giving the best quality talent. Grace said there are no shortcuts to taking an AdNews Agency of the Year Award trophy home on the day. “My advice would be work really hard with your client to find meaningful business results and demonstrate true business impact,” he said. AdNews Agency of the Year Awards are chaired this year by Samsung CMO Josh Grace, who will oversee the radically overhauled awards process and format. Grace's experience both client and agency side make him the perfect candidate for the role, chairing a group of more than 100 judges who are solely brand CMOs – for the first time in AdNews' history. Despite a crowded, noisy marketplace, Grace says the awards are a rare opportunity for agencies to highlight their staff’s achievements. “Awards are important for the whole agency ecosystem in terms of giving recognition,” he says. “AdNews has the benefit of enjoying a long heritage in our industry. They come with a lot of credibility and that’s really important. 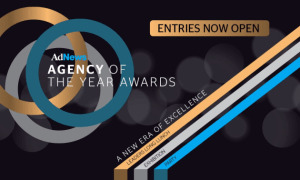 AdNews Agency of the Year – a three-pronged event comprising a leader's long lunch, an exhibition of the finalists work and a party at an affordable price point – will take place at Centennial Hall, Town Hall on 5 April. Deadline for entry is 1 February. A full list of trimmed, new and revised categories is available here.